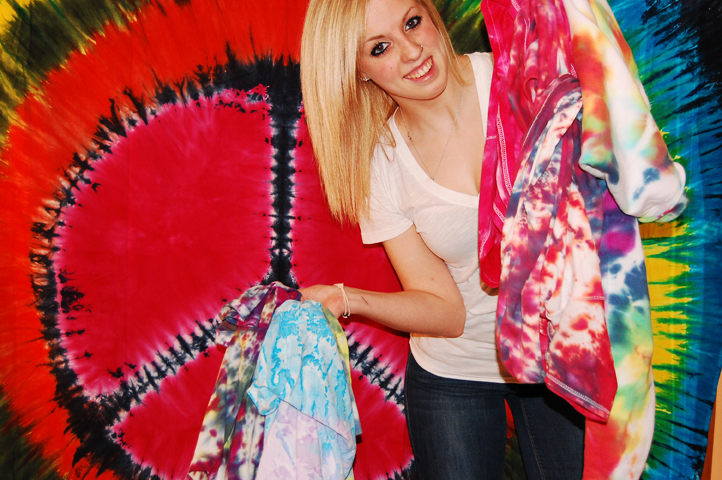 Displaying just a small proportion from her dozens of handmade tie dye clothing options is junior Talia Sturm. Do you know anyone that has 22 tie dye shirts, two tie dye bras, one tie dye underwear, five pairs of tie dye socks, two tie dye sweatshirts, one tie dye bed sheet, one pair of tie dye sunglasses and two tie dye blankets? Well, meet, junior Talia Sturm, the guru of tie dye. Sturm has been tie dying with friends since the summer of 2011 and hasn’t stopped since. Sturm loves to tie die because of the patterns and colors. She gets her ideas like hearts and peace signs from the Internet but otherwise they are spur of the moment. “[Tie dye] is a way to express myself through clothes. That’s just my style,” Sturm said. Just like any other form of art and expression, skills develop with practice. “My first tie dyes weren’t the best that I’ve done, but not bad. They were very light because I did not put enough dye on them,” Sturm said. Sturm tie dyes not only for herself but others as well. She has even used her art of tie dying to make Christmas presents for friends. Sturm said that anyone who ever wants to give her something to tie dye, she’ll do it for them. Although Sturm loves to make tie dye, buying it can be equally satisfying. “Making it is more fun, but it’s such an adventure to search for tie dye things. Some tie dye things you find in stores you can’t really make at home with such vibrant colors. I’d say it’s half and half,” Sturm said. There was a rumor that Sturm was going to stop wearing her tie dye every day at the end of the first semester. This obviously was not true seeing that she still wears it daily. “I was thinking about not wearing it every day because some of my shirts had been beginning to sort of wear out, but not bad, and I have so many other shirts that I don’t even wear anymore. I thought I should start wearing them again. I changed my mind because it was just weird not wearing tie dye. It’s a part of me, and people know me by it,” Sturm said. Through tie dye Sturm has had many fun experiences. One she remembers quite fondly. “My friend and I were tie dying one day in the summer, and we accidentally dyed part of her picnic table, and we were barefoot so the bottom of our feet were very colorful,” Sturm said. One of her favorite pieces she has tie dyed were a pair of shoes. She said they turned out awesome.